The AM642 (AM-642) Series Vandal-Resistant Entrance Panel is a modular series for use with LEE DAN® or TekTone® loud speaker type suite stations. The anodized aluminum panel is available in two sizes. The 4.75" x 11.25" panel accommodates from 2 to 8 push buttons, and the 4.75" x 17.25" panel is used for applications requiring from 10 to 16 push buttons or a postal release option. Panels are equipped with a weather-resistant Mylar speaker protected by a louvered panel and perforated aluminum material. The speaker panel can accommodate up to 16 push buttons and actuators. In addition, the panel also contains up to 16 name holders with plastic lenses that snap easily into the panel and are individually replaceable. 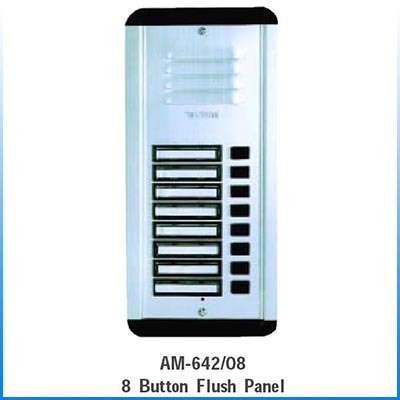 Name holder: 2.125" x 1.065"
Entrance panel shall be TekTone® AM642 (AM-642) Series or approved equal as supplied by LEE DAN®, and shall provide for up to 16 push buttons per speaker panel. The panel shall include a weather-resistant Mylar speaker mounted behind a louvered panel and perforated aluminum material to protect the speaker from damage. Push button switches shall be individually replaceable type with self-wiping contacts. The push button actuator shall be made of solid, extruded aluminum. In addition, the panel shall contain up to 16 individually replaceable name holders. The name holders shall be made of black flame retardant polycarbonate plastic with clear flame retardant polycarbonate plastic lenses to protect card inserts. The AM642 shall have top and bottom decorative end caps that shall also serve as mounting brackets to allow flush or surface mounting. The decorative end caps shall be made of black flame retardant polycarbonate plastic. Each AM642 panel, or approved equal, shall be supplied with name card sheets that may be easily separated into individual name strips. Name strips shall be inserted into name holders without the use of tools.